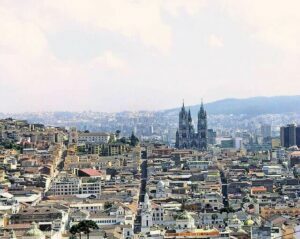 In recent years, Ecuador has opened its doors to foreign investment. The government has introduced various measures to increase foreign presence in Ecuador, an example being the Productivity Development law (Ley de Fomento Productivo). This law introduces huge benefits for new companies looking to register a business and begin commercial activities in Ecuador, offering between 3 and 15 years of income tax exemptions. In 2017, Ecuador’s GDP was approx USD$98.1 billion. Iceland, Liechtenstein, Norway and Switzerland signed a Free Trade Agreement with Ecuador in June 2018. In Ecuador, the service sector contributes to approx. 56.14% of the GDP. The processed food industry is the largest industry in Ecuador after oil. Bananas are Ecuador’s second largest export after Crude Petroleum. The country is becoming one of the most interesting investment destinations in the region, and with a diversification of industries/sectors, commercial interest in the region continues to grow. This article will take you through the 9 major steps involved in creating a company in Ecuador. Ecuador is growing year on year… don’t miss out! In Ecuador, there are 5 types of companies that can be formed, however, by quite a distance the main two are Anonymous Societies and Limited Liability Companies (LLC). Choosing between these two is important as each they have different requirements for minimum capital, the number of partners that the company can have (An LLC in Ecuador can only have 15) and the types of shares in the company. Depending on the type of commercial activity you plan on conducting, you may be limited to certain structures. For example, insurance companies and banks must be an Anonymous Society. Chat with a local group to find out the best legal entity for you, based on your business activities in the region. Every national jurisdiction has its complexities and niche internal processes which can lure the inexperienced into time and money wasting procedures. As in all of Latin America, Ecuador has its own peculiarities that can make forming a corporation very difficult. It is, therefore, a very good idea to hire the services of a local corporate lawyer who can help you to navigate these bureaucratic complications and will ensure that setting up your company is a safe and quick process. This valuable advice will pave the way for a successful market entry. In Ecuador, companies can have only one (1) social goal and up to five (5) ‘additional activities’. Companies are not allowed to perform business that does not fit their social goal/objective. For this reason, it is crucial to choose the correct social goal to fit the types of commercial activity that you will undertake. The first step in forming your company in Ecuador is to reserve your name using the Company Superintendent web page. Once this has been done, you have 30 days to finish the formation process before the name reservation expires. Despite not having a simplified shares company (‘SAS’), as is present in countries such as Colombia and Argentina, you are able to use a simple online process to create either LLCs or Anonymous Societies in Ecuador. You must simply fill out a form containing the basic information regarding the company, shareholders and partners, social capital and the division of shares, to name but a few. Once this information has been filled out, it will be approved by a public notary and the formation documents must be signed, along with proof of the appointment of the legal representative. The authorities will respond directly to this online registration and if successful, will approve the company in the commercial register and provide a tributary ID number (RUC) which will be your official company Tax ID. Although it is not necessarily a formal requirement to have a corporate bank account in order to create a corporation, in order to fulfil certain obligations with the Company Superintendent, you must upload a proof of deposit for the original capital of the company account. It is therefore highly recommended you open your account in advance. In the event that you decide to engage and hire employees in Ecuador, you must register your company with the Ecuadorian Social Services Institute (IESS), and receive a username and password. The payment of benefits and employee contributions will all be done using this online platform. For this process, it is helpful to have a local to help navigate the employee registration process. Finally, once your company has been successfully formed, you must register the office address for your company and pay for the municipal patent and licences for your commercial activity. Interested in Establishing a Commercial Presence in Ecuador? There could not be a more positive and profitable time to invest in Ecuador. New laws such as the Productivity Development law which provide tax benefits for new foreign investment, as well as many other initiatives make conducting business in Ecuador a simple and attractive process. Biz Latin Hub provides a wide range of reliable market-entry service and back-office services and will be the perfect partner to support you and your business in Ecuador. If you require personalised information, contact our Country Manager, Ernesto at [email protected] and see how his team can assist you. Are you informed about your tax and accounting obligations in Ecuador? Check out the short presentation below, created by our accounting team in Quito, Ecuador.